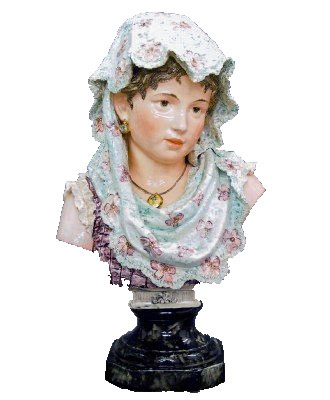 A late 19th century French porcelain portrait bust of a young Gypsy girl. Multi-color glaze decoration, depicted in a Turquoise floral headscarf with enameled earrings and necklace. Impressed numerals “502/7”. Some tiny edge flakes on scarf, slight surface wear. 19 3/4″ high. $875.